Salem Mennonite Church, Tofield, Alberta, 9 August 1948. Source: Mennonite Community Photograph Collection, 1947-1953: Alberta, Saskatchewan, Idaho, Oregon and Montana Congregations. HM4-134 Box 1 photo 010.8-27. 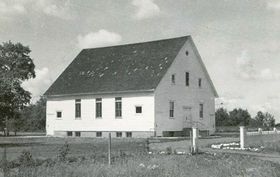 Salem Mennonite Church (Mennonite Church), located near Tofield, Alberta, dates to 1910, when several families, including Bishop N. E. Roth, moved into the area from Nebraska. The congregation was organized under the Western Amish Mennonite Conference; with the arrival of more settlers, including most of the Mayton (Alberta) Mennonite congregation, it affiliated with the Alberta-Saskatchewan Mennonite Conference. The meetinghouse was built in 1911, enlarged in 1915 and 1926, and replaced by a new one, 52 x 80 ft., in 1954. A mission outreach at Round Hill was maintained for a time. Pastoral leaders prior to 1960 included N.E. Roth (bishop, 1911-1939), J. K. Lehman, John B. Stauffer, Milo D. Stutzman, Paul L. Voegtlin and Harold Boettger. Minister Richard Payne served 2000-2007 as a congregational leader; in 2008 Mark Loewen became the pastor. Stauffer, Ezra. History of the Alberta-Saskatchewan Mennonite Conference. 1960: 19. Stutzman, Milo D. and Marlene Epp. "Salem Mennonite Church (Tofield, Alberta, Canada)." Global Anabaptist Mennonite Encyclopedia Online. July 1986. Web. 25 Apr 2019. http://gameo.org/index.php?title=Salem_Mennonite_Church_(Tofield,_Alberta,_Canada)&oldid=141696. Stutzman, Milo D. and Marlene Epp. (July 1986). 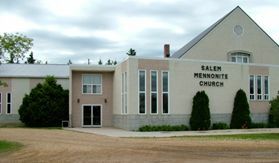 Salem Mennonite Church (Tofield, Alberta, Canada). Global Anabaptist Mennonite Encyclopedia Online. Retrieved 25 April 2019, from http://gameo.org/index.php?title=Salem_Mennonite_Church_(Tofield,_Alberta,_Canada)&oldid=141696. Adapted by permission of Herald Press, Harrisonburg, Virginia, from Mennonite Encyclopedia, Vol. 4, p. 405. All rights reserved. This page was last modified on 6 December 2016, at 04:48.